Skin, oddly enough, is the largest human organ. We wash it, dress it, decorate it, scent it and even tan it. It is flexible and strong but can be soft. It pulls tight over defined muscles or jiggles when we run. It can be completely smooth, sometimes covered in forest-like hair or has hair repeatedly cut from it. It is vital to our lives, but often goes unappreciated and ignored until something goes wrong. The average person has enough skin to cover over 21 square feet and skin makes up 6% to 10% of body weight. With that much surface area and exposure to the outside world, our largest organ can fall prey to a variety of issues. Among all the issues that can affect our skin, eczema is one incredibly uncomfortable, itchy and annoying problem. 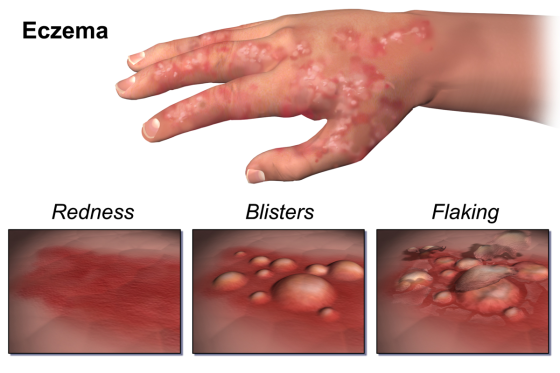 Eczema, also known as atopic dermatitis, is a skin disorder that affects roughly 3% of adults and 10% to 20% of infants and young children. Eczema usually starts with dry, itchy, irritated skin that appears scaly and is sometimes accompanied with a red, patchy rash. It can also cause skin discoloration, severe peeling, cracking and oozing. Along with the discomfort caused by eczema there is more cause for concern since cracked skin leaves the sufferer vulnerable to infection. Though this skin problem is not catching, it is awful and ugly and even when it has been conquered, it may come back at any time. Sadly, there are many causes and exacerbations for eczema sufferers. Some culprits of outbreaks are allergic reactions, chemical contact with the skin, changing weather, body temperature changes, stress and body chemical imbalances. Though eczema can affect the whole body, the most common places to find it is the face, back of the knees, wrists, hands and feet. In order to be properly diagnosed, a trip to a dermatologist, or even your regular general practitioner, will be necessary. There are no real tests for eczema, but through examination and questioning the doctor can give a diagnosis and rule out any other skin conditions. Unfortunately, there is no cure for eczema but rather, several eczema remedies that can control flare ups and speed healing. The first on the list of eczema remedies is the biggest: moisturize! As simple as this may sound, it is a very effective treatment. Liberal use of specially formulated eczema cream or eczema lotion can help soothe irritated skin and lessen itching. Check the ingredients on any eczema cream or lotion and choose products containing corticoid steroids. Corticoid steroids are very good at controlling and soothing inflammation and itching. When treating a child with eczema always check with the child’s doctor before applying any products with corticoid steroids. Eczema cream or lotion can be purchased over the counter and without a prescription. If symptoms persist or are unaffected with at home treatments, a stronger eczema lotion or cream will be prescribed by your doctor. If the case is severe, prescription medication may be in order to ease the flare up along with antibiotics to treat any infections caused by cracked skin. It’s important to make sure skin is clean before applying any eczema cream or lotion. The best method is to apply the cream or lotion just after showering when the skin is still moist. This will help lock in moisture and keep skin from becoming dried out and irritated. Several more applications of cream or lotion will be needed throughout the day to cool the itching and calm the irritation. Along with moisturizing, avoiding eczema triggers is the next step in the eczema remedy ladder. If you have reoccurring outbreaks of eczema a change of washing detergents and/or body cleansers may be in order. Chemicals found in common products like body wash, perfume, soap and laundry detergent can lead to skin irritation or allergic reactions. These irritations and reactions will lead to nasty outbreaks. Switching to hypo-allergenic body products and detergents will help control the irritants that come in contact with your skin. If you’ve changed soaps and detergents but find that you are still having outbreaks, you might be facing environmental allergies. Coming in contact with allergens like pollen or dust can cause irritation and outbreaks. Also, even if you don’t have allergies, simply having a family history of allergies, like allergic rhinitis, may be a contributing factor in your eczema. If you suspect allergies, eczema lotion or cream containing antihistamines will be a good choice. Also, taking an oral antihistamine can help lessen eczema flare-ups. Discuss your options with your doctor to find the right medication for your needs. If your eczema episodes are linked to the changing weather or change in body temperature, you will need to take extra steps to protect your skin. Cold, dry winter weather means more moisturizing to thwart any eczema episodes. If exercising, sweating, or increased body temperature leads to an outbreak, changing to looser, more breathable fabrics will help keep your body cooler, thereby lessening outbreaks. Stress and body chemical imbalances can also contribute to eczema. Stress doesn’t just affect heartrates and sleep; it can wreak havoc on a body’s chemical balance and weaken the immune system. When the immune system is compromised your skin will pay the price. If a stress induced flare up has occurred, treat it with lotion or cream first. The next step is to try to lessen the stress in your life. Trying things like meditation, exercise or just talking with a good friend can help alleviate your stress. If these steps aren’t helping your eczema there may be a more serious imbalance. Talk with your doctor to decide if you need testing to check for any problems. Eczema is a tricky, itchy nuisance that can spring up for a number of reasons. While eczema sufferers wait patiently for a cure, there are steps and actions that can help treat and heal the painful condition. With care and persistence, the battle with eczema can be won. Previous Post - Eczema: The Worst Date Ever.